While primitive humans of the Middle Paleolithic hunted prey and sheltered in caves in Africa, a distant star eighteen times more massive than the Sun, located faraway in the Large Magellanic Cloud (LMC) endured a catastrophic collapse as it reached the end of its life. As the star caved in, its outer layers rebounded off its dense core and blasted outwards, ripping the star apart in a supernova. Some 160,000 years later the light of this supernova, travelling at 300 million metres per second, finally reached Earth to shine in Southern Hemisphere skies on 24 February 1987. The supernova as it went off in the Tarantula Nebula. Image: ESO. 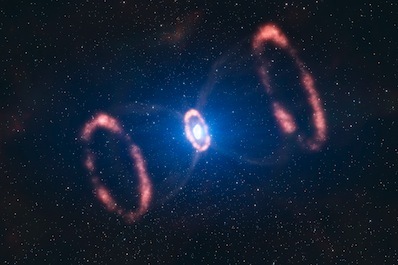 Twenty-five years later supernova (SN) 1987A, as it has become known, is giving astronomers an unprecedented look at what happens to a massive star before and after it explodes. A careful perusal of star charts prior to the supernova allowed the exact star that exploded – Sanduleak (Sk) –69° 202 – to be identified. Sk –69° 202 had been a luminous blue supergiant located on the edge of the great Tarantula Nebula, a giant star-forming region in the LMC. Here stars are born fast and die hard, the glowing veils of the nebula littered with the whorls of ancient supernova remnants – SN 1987A was merely the latest addition to its collection. The �string of pearls� � clumps of matter in an older ring of debris around SN 1987A that are being heated as shock waves and debris from the supernova crash into them. Image: NSA/P Challis and R Kirshner (Harvard�Smithsonian CfA)/B Sugerman (STScI). The Hubble Space Telescope has been following the progress of the expanding cloud of debris since the early 1990s. It has watched as light emitted from the radioactive decay of elements expelled by the supernova – particularly nickel-56 and cobalt-56 – slowly faded. Meanwhile, shock waves were witnessed beginning to buffet a ring of debris a light year wide that had been expelled by tempestuous convulsions within the star thousands of years before it blew up. Fainter, more distant rings have also been detected by Hubble. The shock waves have caused clumps of denser gas within the main ring to light up, a ‘string of pearls’ numbering in their dozens progressing in intensity until, in 2011, Hubble observed the debris from SN 1987A reaching a transition point; the fading was reversed as a new power source took over. An artist’s impression of the rings around SN 1987A. Image: ESO/L Calçada. The bulk of the expanding cloud of debris hurled out by the supernova is now smashing into the older ring so violently that it generates X-rays, which excite the gas in the expanding debris and cause it to glow. NASA’s Chandra X-ray Observatory has observed these X-rays, confirming what is happening. SN 1987A is now a true ‘supernova remnant’ in the vein of the Crab Nebula or Cassiopeia A, illuminated not by the explosion of the star but by collisional processes between the debris and material beyond it. Such supernova remnants are highly energised regions: many high-energy cosmic rays are found to be produced by them. A mystery remains, however; a supernova generally leaves behind what was once the core of the star in the form of a rapidly rotating neutron star: a pulsar. However the regular blip-blip-blip of radio, X-ray or even gamma-rays from a pulsar has yet to be detected. So was a pulsar born in the explosion of Sk –69° 202? Or was the supernova so catastrophic that its core collapsed beyond even the point of a neutron star and instead into a black hole? It is possible that the pulsar is being obscured by dust and, if we are not in the line-of-sight of its radio beams, we may otherwise miss it. What is now known is that there is plenty of dust present to hide a neutron star. A wider view of the region around SN 1987A, showing the inner ring and two outer rings. Image: ESA/Hubble and NASA. 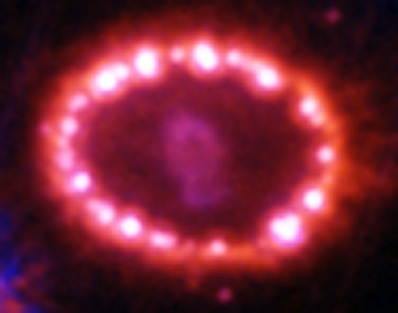 Hubble and Chandra are not the only space telescopes to have spied on SN 1987A. The largest space telescope ever launched, the European Space Agency’s infrared-seeking Herschel Space Observatory, with its 3.5-metre mirror, has also been turned towards the remnant. Whereas Hubble and Chandra are generally observing the warmer, glowing parts of the stellar debris, Herschel sees cold dust at a chilly –250 degrees Celsius in far (long) infrared wavelengths. SN 1987A, it turns out, was like a dust-bomb, with estimates of the total dust it threw into space, based on the infrared brightness of the dust (200 times brighter than the Sun is at the same wavelength of light) implying enough dusty material to build the equivalent of 200,000 Earth-mass planets. Mingled within the dust are elements as diverse as oxygen, nitrogen, sulphur, silicon, carbon and iron. This immense amount of dust has been beyond expectations and, if all supernovae spew out this much dust, it helps explain why young galaxies that we can see existing in the early Universe, which have high rates or star birth and death, are so dusty. The dust, however, isn’t a nuisance to be wiped away – this is the material that goes into building new planets, moons and even life. The iron in your blood and the calcium in your bones all came from supernovae like SN 1987A, as mostly did the oxygen we breath and the carbon in our constituent molecules (dying Sun-like stars that turn into red giants rather than supernovae also produce lots of dust containing some elements such as oxygen and carbon). The birthplace (or should that be ‘deathbed’?) 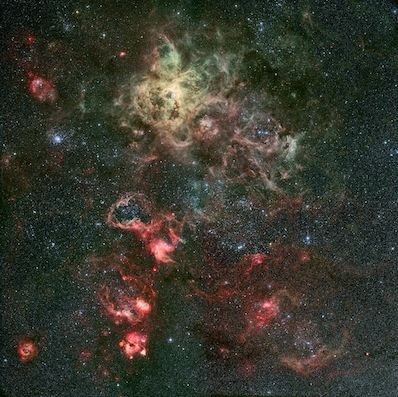 of SN 1987A: the Tarantula Nebula in the Large Magellanic Cloud. The supernova remnant is too small top be seen, but resides to the middle right of the picture. Image: ESO. 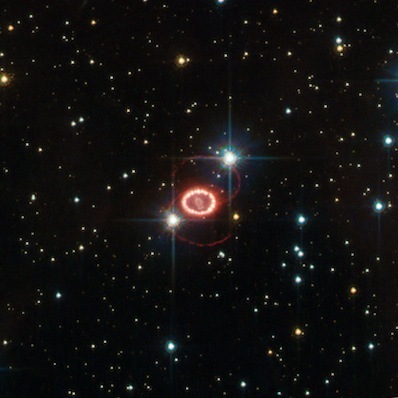 SN 1987A was astounding for a variety of reasons. It was the last supernova to be visible to the unaided eye in the night sky (it was first spotted by astronomers Ian Shelton and Oscar Duhalde at the Las Campanas Observatory in Chile). 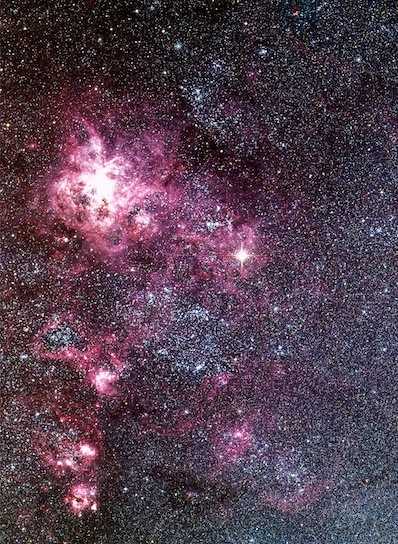 While not a galactic supernova, it was the next best thing, remarkably close in the LMC. Furthermore, its proximity has allowed us to follow the story of the death of a giant star and, in the form of the outer rings and the identification of the progenitor star in the shape of Sk –69° 202, some of he events leading up to its destruction. Supernovae are popping off all the time in distant galaxies, but nobody knows when the next close, bright supernova will take place. When it does, SN 1987A will have prepared us for what to expect. A torrent of ghost-like neutrino particles had arrived with the light from SN 1987A and its possible our first indication that another nearby supernova has gone off, before it has even been spotted in the skies, will be another burst of neutrinos. Either way, in all likelihood the star has already exploded – we just don’t know it yet.